What does this mean to you? That depends. Are you a Realtor? Then it is bad. Business is really slow. Are you an ordinary non-Realtor, perhaps a home owner concerned about the value of your largest asset or somebody interested in house prices as an important economic indicator? Then this means nothing. The chart illustrates why you should just ignore this monthly release of hot air from the NAR. The squiggly line is their count of monthly home sales, seasonally adjusted. The smoother line is the S&P Case-Shiller 10 City Composite of house prices. If prices are what you care about, notice that the sales tally is related to prices, but not by enough to be particularly useful. 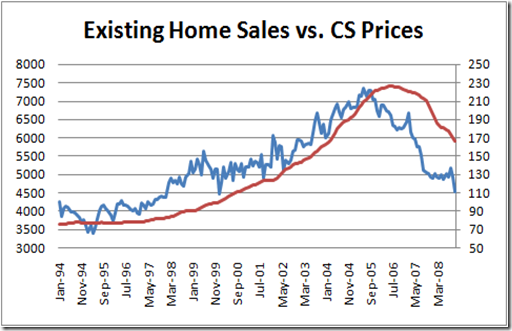 Note, for example, that sales peaked a year before prices did, in the summer of 2005. 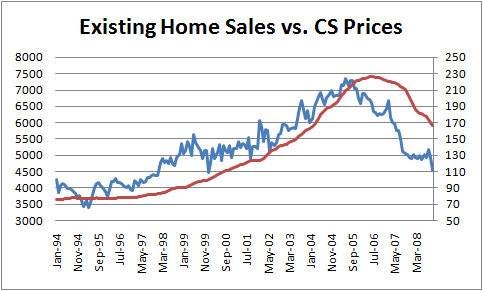 Note also the years 1999 and 2000, when sales were roughly flat but prices went up 26%. It’s hard to attach profound meaning to house sales volume. Low sales could mean that sellers are unwilling to sell at the going rate and are holding out for higher prices. Or it could mean that buyers are unwilling to buy at the going rate and are holding out for lower prices. Or both. Or neither. Temporary dislocation in the mortgage business or uncertainty over a new government subsidy for home buyers could have also slowed things down. NAR President Charles McMillan, a broker with Coldwell Banker Residential Brokerage in Dallas-Fort Worth, said it’s ironic with the weak housing market that affordability conditions have improved dramatically. Hmmm. Low house prices making houses more affordable is ironic? Perhaps Mr. McMillan NAR’s PR guy got his SAT words confused. He meant tautological. It’s a simple mistake. Actually, the Cash-Shiller index is a 3-month moving average. If you take the 3-month moving average of the blue squiggly line, I think you’ll find the peak in sales and prices coincide. Oops, my bad. The ticks on your horizontal axis are 10 months apart (?! ), not 1 month. Ignore my previous comment.